But learning how to tally the points—and to keep track of the score during a fast-paced match—can seem daunting if you are a beginner. Read on, and you'll understand and keep up with the game in no time. If you win a coin toss or a spin of the racquet, you get to choose whether you serve or receive the serve. If you choose to serve, your opponent gets to pick which end of the court to start on. This may seem like a small concession, but if the sun is shining in your eyes, the starting position can definitely influence the outcome of the game. To serve, you position yourself at the right side of the back of the court, which is called the baseline. If you serve first, your opponent must return the ball after exactly one bounce into any part of the singles section of your court. You and your opponent then continue to return the ball back and forth—which is known as a volley—until either one of you misses the ball, the ball bounces more than once on one side of the court, or the ball is hit out of bounds. If you miss, or your shot bounces or goes out of bounds, your opponent wins the point, and vice versa. If you win the first point, you must announce the score at your next serve: "15–love." Love is equal to zero, and 15 equals one point. The server -- in this case, you -- always announces his or her own score first. Additional points are counted in increments of 15 up to two points, then the next point is scored as 10—yes, we know it doesn't make any sense, but it's the way the sport works. You will continue to serve until someone wins the game. So, if your opponent happens to win the next point, you will announce "15–all" before your next serve, meaning you and your opponent are tied. If your opponent wins the next point as well, you would announce "15–30." You will continue to serve until one of you wins the game. So what constitutes a win in a game of tennis? Simple: one of you has to win by two points. Say your opponent wins the point after you are up 40–30, the score would then be tied, and you would announce: "40–all," otherwise known as "deuce." Now you continue to play until one of you has a two-point advantage and wins the game. On televised games, this is the point at which you'll notice that the scoreboard changes. Points are no longer calculated. Instead, players either have the "advantage" (i.e., are one point away from two points), or they are tied in a "deuce." That's why some games seem to go on forever. Until one player achieves a two-point advantage, the game will go on...and on. But, that's also what makes tennis exciting. Once you have won six games, you've won a set. But, wait, you're still not finished. If the previous set ended with an odd-numbered total of games, you and your opponent switch sides of the court to begin the new set. You switch ends after every odd game through each set. At the start of a new set, in the above example, you served first. So, your opponent would get to serve to start the new set. In men's professional tennis, players generally must win three out of five sets to win a match. In women's professional tennis, players generally must win two out of three sets to win the match. If you're a beginner, do yourself a favor: Whether you're male or female, decide that the victor will be the player who wins two out of three sets. Your tired feet—and potential tennis elbow—will thank you. 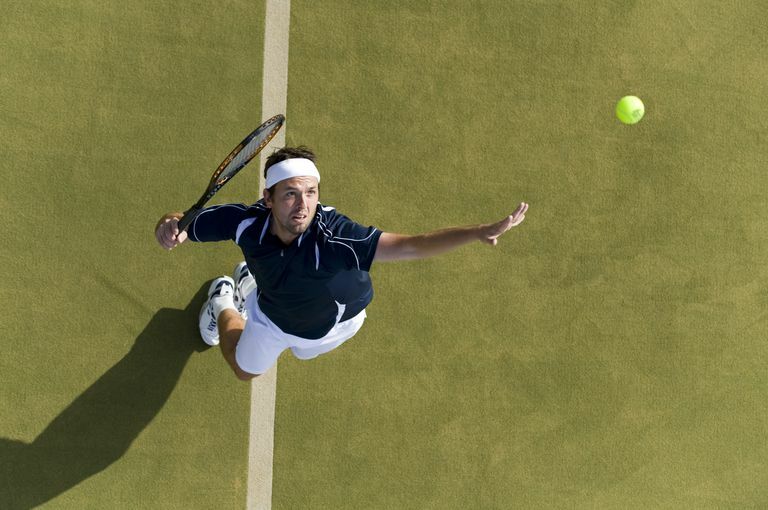 Do You Know How to Win Singles Tennis Matches? What Type of Tennis Ball Do You Need? What Is the Open Era in Tennis?